Part 1 of this series provided information on heart function, ECG basics, HRV basics and how the Autonomic nervous system influences heart rate. For Part 2, I’ll discuss and display basic HRV analysis concepts to try and enhance your understanding of HRV. I’ll relate as much of this discussion as possible to smart-phone based HRV tools as it is unlikely that most readers of this site have access to an ECG. Fit individuals generally have lower resting heart rates and greater parasympathetic activity at rest. These adaptations to training may be a result of both intrinsic heart adaptations (SA node remodeling, increase in ventricle capacity) and autonomic adaptations (greater vagal activity). Below is an ECG segment from a collegiate male endurance athlete. 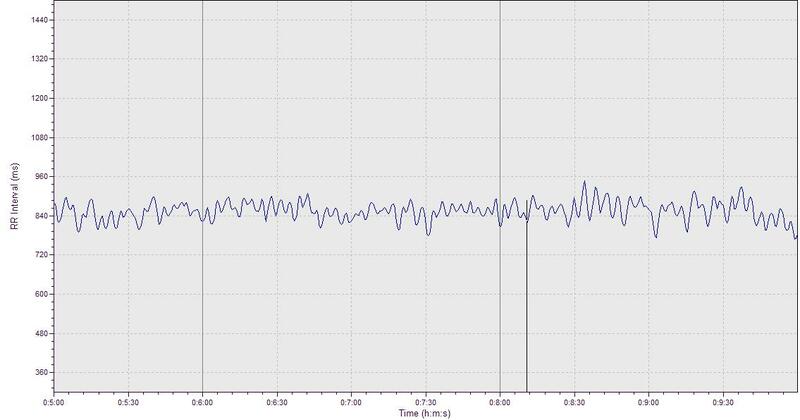 This sample is likely capturing the normal fluctuation in heart rate that occurs in response to respiration (breathing). Heart rate tends to speed up on inspiration and slow down on expiration. The technical term used to describe this phenomenon is “Respiratory Sinus Arrhythmia”. For comparison, below is a screen shot of a healthy non-athlete ECG. 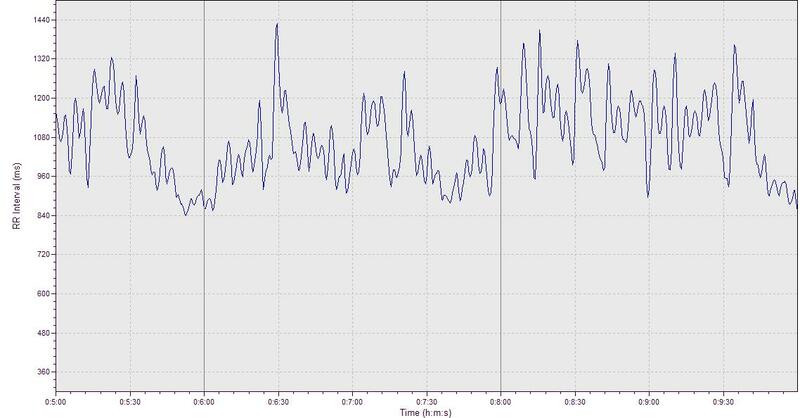 Here, you can clearly see a higher resting heart rate and less variability. 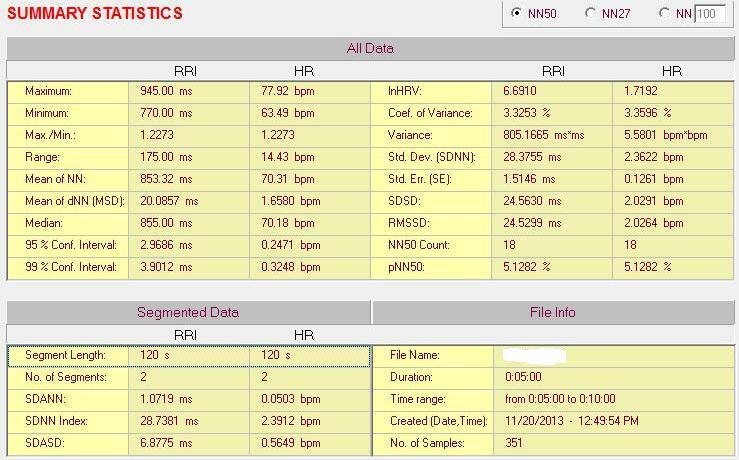 The Excel snap shot below is what R-R interval data looks like once exported from the ECG software (Acqknowledge in this case) to a workbook. Though specialized HRV software is much more functional, it’s certainly possible to perform some time series (statistical) analysis on the R-R interval data with basic excel functions (i.e. Standard Deviation, Mean R-R Interval, RMSSD, etc.). Today, we’ll focus primarily on RMSSD as this parameter appears to be the preferred HRV index for athlete monitoring (See Plews et al. 2013 and this for more on RMSSD). With HRV software analysis, ECG recordings are converted to a tachogram, which plot the successive R-R intervals on the y-axis and the number of beats within the ECG segment on the x-axis. This provides a nice visual representation of heart rate variability over a given time and makes for easy software analysis. 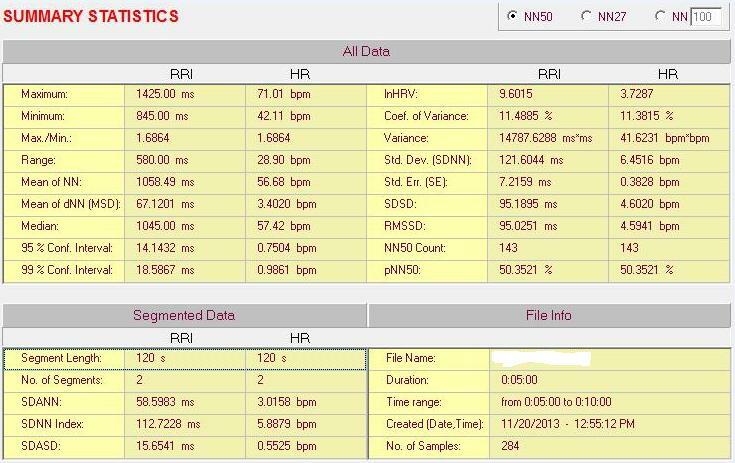 Below is a 5 minute ECG segment from an endurance athlete converted to a tachogram with our Nevrokard HRV software. Notice how the R-R intervals vary considerably over a broad range. The time domain values follow. In contrast, below is the tachogram and time domain analysis of an age matched non-endurance athlete for comparison. Note how the R-R intervals are relatively stable and within a narrow range, demonstrating less variability. To put this in perspective for the good folks using ithlete or BioForce, I’ll convert the raw RMSSD values (displayed in the “Summary Statistics” screen shots above) to ithlete/BioForce values. To do this, we simply log transform the raw RMSSD and multiply it by 20 (lnRMSSDx20). Keep in mind that the ithlete uses a 55-sec test and BioForce uses 2.5-min test. The values shown here are from 5-min ECG samples, but you get the idea. Last post, I discussed “normal” beats originating from the SA node. Any beats originating from outside the SA node disturb cardiac rhythm and can therefore impact HRV. These are called ectopic beats. 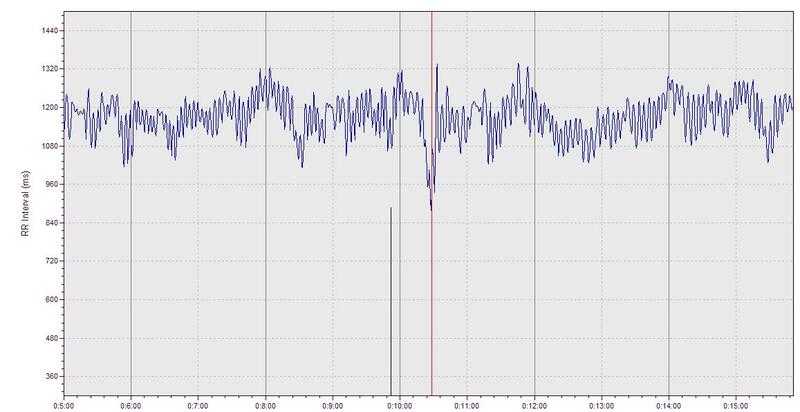 Electrical interference, or excessive noise or movement can create “artifacts” which can also affect the data. It’s important to manually inspect ECG data for ectopic beats or artifacts and correct them (replace with the adjacent “normal” cycle) or discard the ECG sample entirely if there are excessive disturbances. Most smart-phone HRV tools do not provide R-R interval data and therefore manual inspection for ectopic beats is impossible. Conveniently, devices such as ithlete and BioForce are designed to automatically detect and correct irregular beats. For example, the application will detect and replace R-R intervals that are unlikely to occur in healthy, resting individuals (e.g., R-R intervals below 500ms or above 1800ms). I’d assume OmegaWave Pro, SweetBeat and other devices also have this feature. Below is an example of an ectopic beat from an ECG which appears to be a premature atrial contraction. You’ll see this again in a moment on the tachogram as well. For athlete monitoring, HRV data is ideally collected as soon after waking in the morning as possible after bladder emptying. We want as close to resting conditions as possible. It would be wise to avoid checking e-mails, text messages and anything else that can alter mood, excite you, upset you, etc. Even water consumption will have an acute impact on HRV. Consistency of measurement protocol and time of measurement are important for longitudinal monitoring. In addition, being as motionless as possible and undisturbed is equally as important. In the screen shot below towards the right hand side, we can clearly see when the individual gets restless and moves or adjusts his position. We can also see the ectopic beat that occurs toward the start of the measure (same ectopic beat shown above in the ECG). Slight and subtle movements can clearly impact heart rate so be as still as possible when you perform your measures at home. 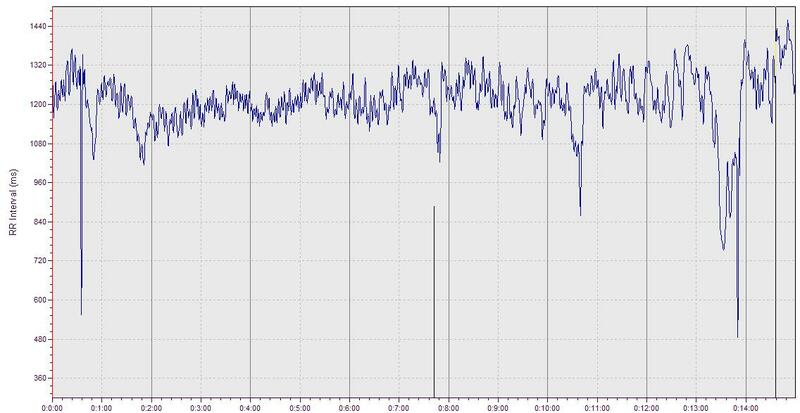 In the tachogram below, notice how heart rate changes considerably at around the 10 minute mark. This is a result of a researcher entering the exam room where the subject was resting during an ECG recording. Clearly, the resting condition was disturbed as the subject was excited/stressed from the person entering the room. Thus, do your best to remain as undisturbed as possible when performing a measure at home. All data shown today were from supine ECG recordings. Next post I’ll discuss and show HRV changes in response to postural change (i.e., from supine to standing). This entry was posted in Heart Rate Variability, Monitoring and tagged analysis, ECG, heart rate variability, HRV, RMSSD, Tachogram. Bookmark the permalink. just out of curiosity, is the athlete vs non-athlete of the same age ? and since you mentioned collegiate I would assume that the sample is under 25 years old ? Yes, both were around 20 years old. I don’t suppose you got any samples of athlete vs non-athlete between the ages of 40, 50 and 60. just to get some idea of HRV representation on different age group. I haven’t personally collected data in that population, but we may have some on file. However, they are likely clinical subjects and therefore not representing a “healthy” group. Is there any standard protocol commonly accepted in scientific literature? Is there any difference or standard error between devices (polar, garmin etc)? I work in Spain as S&C coach in a soccer club and the idea is to implement a fast & comfortable protocol to measure HRV in our lockers. Knowing the fact that disturbances could affect HR, I would like to know what should be our basics to avoid that disturbances. In the literature, the last 5 min of a 10 min supine rest period are analyzed for short-term HRV analysis. However, recently, the last 5 min of a 6 min rest supine rest period has been used in research with elite endurance athletes. Much of the research I am involved with now is in validating field tools (smart phone HRV devices) and assessing the suitability of shortened HRV measurements duration’s (e.g., 60 second or less) and shorter stabilization periods prior to HRV assessment. There are several cross-validation papers on the Polar system that you can find on google scholar. It’s accepted as a valid field tool for research so I’d be confident in using it. Keep in mind that data analysis is a bit more time consuming however vs. a mobile phone app. I have not looked into the Garmin device so I cannot comment on its validity. .
Is there a specific reason that 20 in the number you multiply the lnRMSSD by? Yes, multiplying lnRMSSD by 20 makes for a more intuitive figure on a 100 point scale. This makes interpretation a little more user friendly for non-expert users. Most apps and watches only measure time domain hrv but frequency measures give not only ans activity but also balance indicators. As for protocol since the HRV is known to have circadian rhythm due to changing of ANS balance measurement should take place in the morning upon waking. Avoid too bright light or noise, maintain proper room temperature, lie down,don’t move or talk, keep eyes open. Breathe naturally, don’t control the breathing intentionally. Hosand meausres a 5 minute period. ive a few clinical descriptors on population studies for mean sdnn which is the time domain standard measure for hrv that suggest; 50ms↑: High normal, ANS’s regulating function and stress coping ability is good. 35~50: Low~Mid normal, ANS’s regulating function and coping ability is normal 20~35: Low, there’s risk of developing stress induced disease, weakened ANSfunction 20↓: Very Low, there’s high risk of having chronic stress induced disease related to ANS dysfunction. For frequency the heart power output reading based on population for 20-40 yrs averages 1500-2000ms2. Thanks for chiming in. I agree that spectral measures can provide more insight, but this comes at a much greater cost – longer measurement duration. It’s difficult getting athletes to routinely perform 55 second tests every morning on their smart phone, 5-min assessments would be out of the question (in my situation). However, if you can get that kind of compliance from your athletes, then by all means, use the more sophisticated systems. I’m looking at HRV for athletes. It seems to get quite technical, quite quickly. Could you give me some steers please? 3. for a non-athletic 45year old who was athletic whilst younger, what would a good hrv be? or is there a table somewhere describing ranges of ages/athletic ability ? 1. As I have not personally collected data on master’s endurance athletes, I’ll have to find some published work when I have some time. I’ll make a note and try and get back to you on this one. HRV tends to decrease with age, however regular endurance exercise can attenuate this. e) Compatible with a finger sensor or Bluetooth HR strap. I also like an app called HRV4Training. This app gives you the option of doing an orthostatic test (HRV in response to postural change, supine to standing). This app provides several HRV values. It can stand some visualization improvements. Compatible with Bluetooth HR strap. 3. HRV is largely individual. From within a collegiate cross-country team (males, VO2 ~ 62) I’ve seen lnRMSSD (resting, supine 5 min ECG recording) range between 3.9 – 5.2 with an average of about 4.5. For a non-athlete 45 year old, I would expect much lower values. 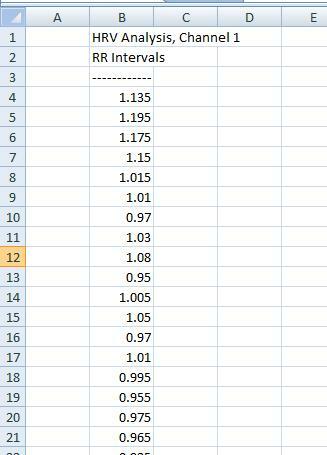 As I mentioned above, when I have some time, I’ll search through some published work to find some reported values for these populations. been using hrv now for a while….very enlightening. I had a race at the weekend. the day before the race hrv was about 72.
race finished at about 10am and I did 30 mins of recovery exercise. race was 90 minutes or thereabouts. afterwards (ie still race day) I did 3x hrv reading and got 93, 88 and 85.
why would I get these high readings high 80s/lo 90s? they obviously were NOT incorrect readings. and I would have expected readings in the 60s/70s. An old thread, so you may have found your own answers by now. I am not in any way qualified, however, I have measure HRV for several years, and now daily, as I started to experience Exercise Induced Arrhythmia almost 2 years ago (although I did not know what it was at the time) Due to the EIA, I also record HRV readings that are higher after exercise – even the next morning – due to ectopic beats and sinus pauses. Have you tried a 12 wire ECG stress test? Many people are unaware of the amount of ectopic activity they have.